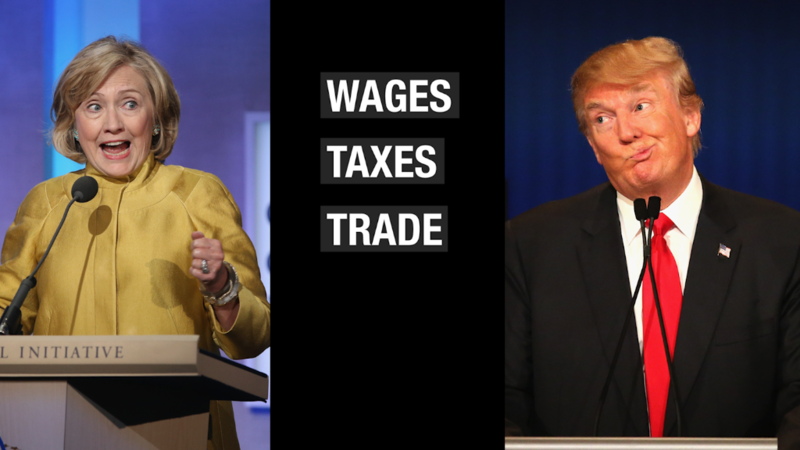 Economists think Hillary Clinton in the White House would be far better for U.S. businesses than Donald Trump. In fact, economists pick Libertarian candidate Gary Johnson as their second choice, according to a new survey from the National Association for Business Economics of over 400 experts. Trump comes in third. "A majority (55%) choose Democratic nominee Hillary Clinton, followed distantly by Libertarian nominee Gary Johnson (15%) and Republican nominee Donald Trump (14%)," says LaVaughn Henry of the NABE. "The remaining 15% said they 'don't know.'" The results are another sign of how Trump is struggling to connect with the business community despite touting his own record as a business titan. Trump's push to restrict trade and immigration are exactly the opposite of what most economists say the U.S. should be doing to boost growth. Trump promises to cut taxes for companies. He wants to reduce the corporate tax rate from 35% to 15%. It's a move that has typically played well with businesses. But this election, economists worry about the bigger picture. Immigration is a top issue for the business economists. Sixty-one percent of the NABE survey respondents said the U.S. needs to allow more immigration, especially for workers with top skills. Clinton has a plan to increase highly-skilled immigration, the so-called H-1B visa program. She also wants to create a route to citizenship for immigrants in the U.S. illegally. A large majority of economists -- 65% -- also say the next president has to be "more open" to free trade, exactly the opposite of what Trump has been preaching on the campaign trail. Trump has been clear that he thinks America is a loser on trade and that the U.S. needs to fight back against China, Mexico and others. There are concerns that the hefty tariffs he wants to put on goods coming to the U.S. from China and Mexico would cause a trade war in addition to make a lot of products more expensive for Americans. NABE surveyed over 414 economists who work in all different industries -- from construction to finance -- from July 20 to August 2. While NABE members favor Clinton to lead the economy, they say overall uncertainty from this election is holding back U.S. economic growth. Trump once had a sizable lead over Clinton when voters were asked which candidate would be better at handling the economy. That has evaporated after the conventions.